An Attic pyxis (jar/box), 440-430 B.C.E. British Museum. According to Greek mythology, Pandora was the first woman ever created by the head god Zeus as a punishment for humankind after Prometheus stole fire for human use. Pandora held a box (actually a jar =pithos), known today as Pandora's Box, which contained all the world's evils. She was told to never open the jar; however, she could not resist peeking into the container, and upon opening it, allegedly unleashed all evil into the world. Afterwards, she tried to close the lid but it was too late; however, Hope remained inside the jar/box, providing humanity with a degree of solace. The myth of the Pandora's Box has been widely criticized as an example of misogyny (hatred for women) because it attributes the origin of evil in the universe to the existence of a woman. In popular speech today, the saying "Opening a Pandora's Box" suggests bringing up an issue that will likely make matters worse and compound the problem rather than alleviate it. no helpmeets in hateful poverty, but only in wealth. yet, when he is dead, his kinsfolk divide his possessions amongst them. Hesiod concedes that occasionally a man finds a good wife, but still "evil contends with good" (609). Hesiod closes with this moral (105): "Thus it is not possible to escape the mind of Zeus." Later mythographers would fill in minor details or add postscripts to Hesiod's account. For example, Apollodorus and Hyginus each make explicit what might be latent in the Hesiodic text: Epimetheus and Pandora were married. They each add that the couple had a daughter, Pyrrha, who married Deucalion and survived the deluge with him. However, the Hesiodic Catalogue of Women, fragment #2, had made a "Pandora" one of the daughters of Deucalion, and the mother of Graecus by Zeus. "Pandora" was also named as a daughter-in-law of Noah in writings attributed to the Chaldean historian of the third century B.C.E., Berossus, by the fifteenth century monk Annio da Viterbo, but this is now widely regarded as a forgery. the others have left and gone to Olympus. and the Graces, my friend, have abandoned the earth. men no longer recognize the rules of conduct or acts of piety. Theognis seems to be hinting at a myth in which the jar contained blessings rather than evils. In this, he appears to follow a possibly pre-Hesiodic tradition (preserved by the second-century C.E. fabulist Barbrius) that the gods sent a jar containing blessings to humans. A "foolish man" (not Pandora) opened the jar, and most of the blessings were lost forever. Only hope remained. M.L. 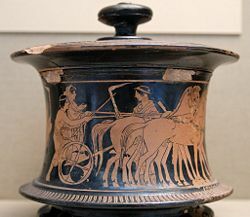 West writes that in earlier myths, Pandora was married to Prometheus, and cites the ancient Catalogue of Women as preserving this older tradition, and that the jar may have at one point contained only good things for mankind. He also writes that it may have been that Epimetheus and Pandora and their roles were transposed in the pre-Hesiodic myths, a "mythic inversion." He remarks that there is a curious correlation between Pandora being made out of earth in Hesiod's story, to what is in Apollodorus that Prometheus created man from water and earth. (Apollodorus, Library and Epitome, ed. Sir James George Frazer.) Hesiod's myth of Pandora's jar, then, could be an amalgam of many variant myths. 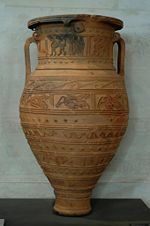 A pithos from Crete, ca. 675 B.C.E. Louvre. The mistranslation of pithos as "box" is usually attributed to the sixteenth century humanist Erasmus of Rotterdam when he translated Hesiod's tale of Pandora. Hesiod uses the word "pithos" which refers to a jar used to store grain. Erasmus, however, translated pithos into the Latin word pyxis, meaning "box". The phrase "Pandora's box" has endured ever since. In Hesiodic scholarship, the interpretive crux has endured: Is Hope's imprisonment inside the jar a benefit for mankind, or a further bane? A number of mythology textbooks echo the sentiments of M.L. West: "[Hope's retention in the jar] is comforting, and we are to be thankful for this antidote to our present ills." Some scholars such as Mark Griffith, however, take the opposite view: "[Hope] seems to be a blessing withheld from men so that their life should be the more dreary and depressing." One's interpretation hangs on two related questions: First, how are we to render elpis, the Greek word usually translated as "hope"? Second, does the jar preserve Elpis for men, or keep Elpis away from men? The first question might confuse the non-specialist. But as with most ancient Greek words, elpis can be translated a number of ways. A number of scholars prefer the neutral translation of "expectation." However, expectation of what? Classical authors use the word elpis to mean "expectation of bad," as well as "expectation of good." Statistical analysis demonstrates that the latter sense appears five times more than the former in all of ancient Greek literature. Others hold the minority view that elpis should be rendered, "expectation of evil." How one answers the first question largely depends on the answer to the second question: should we interpret the jar to function as a prison, or a pantry? The jar certainly serves as a prison for the evils that Pandora released—they only affect mankind once outside the jar. Some have argued that logic dictates, therefore, that the jar acts as a prison for Elpis as well, withholding it from men. If one takes elpis to mean expectant hope, then the myth's tone is pessimistic: All the evils in the world were scattered from Pandora's jar, while the one potentially mitigating force—Hope—remains locked securely inside. This interpretation raises yet another question, complicating the debate: are we to take Hope in an absolute sense, or in a narrow sense where we understand Hope to mean hope only as it pertains to the evils released from the jar? If Hope is imprisoned in the jar, does this mean that human existence is utterly hopeless? This is the most pessimistic reading possible for the myth. A less pessimistic interpretation (still pessimistic, to be sure) understands the myth to say: countless evils fled Pandora's jar and plague human existence; the hope that we might be able to master these evils remains imprisoned inside the jar. Life is not hopeless, but each of us is hopelessly human. An objection to the hope is good/the jar is a prison interpretation counters that, if the jar is full of evils, then what is expectant hope—a blessing—doing among them? This objection leads some to render elpis as the expectation of evil, which would make the myth's tone somewhat optimistic: although humankind is troubled by all the evils in the world, at least we are spared the continual expectation of evil, which would make life unbearable. Seemingly the most popular interpretation is the optimistic reading of the myth expressed (e.g.) by M.L. West. Elpis takes the more common meaning of expectant hope. And while the jar served as a prison for the evils that escaped, it thereafter serves as a residence for Hope. West explains, "It would be absurd to represent either the presence of ills by their confinement in a jar or the presence of hope by its escape from one." Hope is thus preserved as a benefit for humans. The etymology of Pandora's name provided in Works and Days is an incorrect folk etymology. Pandora properly means "all-giving" rather than "all-gifted." An alternate name for Pandora attested on a white-ground kylix (ca. 460 B.C.E.) is Anesidora, which similarly means "she who sends up gifts." The vase painting clearly depicts Hephastus and Athena putting the finishing touches on the first woman, as in the Theogony. Written above this figure (a convention in Greek vase painting) is the name Anesidora. More commonly, however, the epithet anesidora is applied to Gaea or Demeter. This connection of Pandora to Gaea and Demeter through the name Anesidora provides a clue as to Pandora's evolution as a mythic figure. In classical scholarship it is generally posited that—for female deities in particular—one or more secondary mythic entities sometimes "splinter off" (so to speak) from a primary entity, assuming aspects of the original in the process. The most famous example of this is the putative division of all the aspects of the so-called Great Goddess into a number of goddesses with more specialized functions—Gaea, Demeter, Persephone, Artemis and Hecate among them. Pandora appears to be just such a product of this process. In a previous incarnation now lost to us, Pandora/Anesidora would have taken on aspects of Gaea and Demeter. She would embody the fertility of the earth and its capacity to bear grain and fruits for the benefit of humankind. Jane Ellen Harrison turned to the repertory of vase-painters to shed light on aspects of myth that were left unaddressed or disguised in literature. The story of Pandora was repeated on Greek ceramics. On a fifth-century amphora in the Ashmolean Museum (her fig.71) the half-figure of Pandora emerges from the ground, her arms upraised in the epiphany gesture, to greet Epimetheus. A winged ker with a fillet hovers overhead: "Pandora rises from the earth; she is the Earth, giver of all gifts," Harrison observes. Over time this "all-giving" goddess somehow devolved into an "all-gifted" mortal woman. T. A. Sinclair, commenting on Works and Days argues that Hesiod shows no awareness of the mythology of such a divine "giver." A.H. Smith, however, notes that in Hesiod's account Athena and the Seasons brought wreaths of grass and spring flowers to Pandora, indicating that Hesiod was conscious of Pandora's original "all-giving" function. Jane Ellen Harrison sees in Hesiod's story "evidence of a shift from matriarchy to patriarchy in Greek culture. As the life-bringing goddess Pandora is eclipsed, the death-bringing human Pandora arises." Thus Harrison concludes "in the patriarchal mythology of Hesiod her great figure is strangely changed and diminished. She is no longer Earth-Born, but the creature, the handiwork of Olympian Zeus." Robert Graves, quoting Harrison,  asserts that "Pandora is not a genuine myth, but an anti-feminist fable, probably of his [Hesiod's] own invention." The Hesiodic myth did not, however, completely obliterate the memory of the all-giving goddess Pandora. A scholium to line 971 of Aristophanes' The Birds mentions a cult "to Pandora, the earth, because she bestows all things necessary for life." Certain vase paintings dated to the fifth century B.C.E. likewise indicate that the myth of the goddess Pandora endured for centuries after the time of Hesiod. The myth's misogyny is apparent in the transformation of a goddess who gives all good things to men into a mortal woman who is both intrinsically evil and also introduces every conceivable evil to mankind. Modern feminist literary criticism has also focused on the gendered symbolism inherent in the myth. Pandora's jar, according to this school of thought, represents the female womb. That the jar releases myriad evils upon the earth suggests the phallocentric culture's unease with female sexuality. ↑ J. Holland, "Misogyny: The World's Oldest Prejudice" (Avalon Publishing Group, 2006), 12-13. ↑ As we often find in Greek mythology, this is a folk etymology and thus inaccurate. In Greek, Pandora's name has an active rather than a passive meaning; hence, Pandora properly means "All-giving." The implications of this mistranslation are explored in "All-giving Pandora: mythic inversion?" below. ↑ A pithos is a very large jar, usually made of rough-grained terra cotta, used for storage. ↑ Contra M.L. West, Works and Days, p.168. "Hesiod omits to say where the jar came from, and what Pandora had in mind when she opened it, and what exactly it contained." West goes on to say this contributes to the "inconclusive Pandora legend". ↑ M.L. West, Works and Days, p.164. ↑ The scholar M.L. West has written that Erasmus may have confused the story of Pandora with the story found elsewhere of a box which was opened by Psyche. ↑ As he puts it in his 1978 commentary ad 96. ↑ In his 1983 commentary ad PV 250. ↑ E.g., Verdenius 1985; Blumer 2001. ↑ The prison/pantry terminology comes from Verdenius 1985 C.E. 96. ↑ Scholars holding this view (e.g., Walcot 1961, 250) point out that the jar is termed an "unbreakable" (in Greek: arrektos) house. In Greek literature (e.g., Homer, and elsewhere in Hesiod), the word arrektos is applied to structures meant to sequester or otherwise restrain its contents. ↑ See Griffith 1984 above. ↑ Thus Athanassakis 1983 in his commentary ad Works 96. ↑ Taking the jar to serve as a prison at some times and as a pantry at others will also accommodate another pessimistic interpretation of the myth. In this reading, attention is paid to the phrase moune Elpis—"only Hope," or "Hope alone." A minority opinion construes the phrase instead to mean "empty Hope" or "baseless Hope": not only are humans plagued by a multitude of evils, but they persist in the fruitless hope that things might get better. Thus Beall 1989, 227-28. ↑ Hence, possibly, the variant myth that Pandora's jar contained blessings for mankind. ↑ Harrison, Prolegomena 1922, 280-83. ↑ Compare the rising female figure, identified as Aphrodite, on the "Ludovisi Throne". ↑ Sinclair (ed. ), Hesiod: Works and Days (London: Macmillan, 1932), 12. ↑ Smith, "The Making of Pandora" The Journal of Hellenic Studies 11 (1890), 278-283. ↑ William E. Phipps, "Eve and Pandora contrasted" Theology Today 45 on-line text Retrieved June 3, 2008. ↑ Harrison, Prolegomena to the Study of Greek Religion (1903) 1922:283-85 quoted in Graves, The Greek Myths (1955) 1960, sect.39.8 p. 148. ↑ See, for example, Reeder 1995, 195-99 and 277-279; Zeitlin 1995 passim, but particularly the chapter on Pandora: "Signifying Difference: The Case of Hesiod's Pandora." For an extensive bibliography on women in ancient Greek myth and society, see the list of references compiled by John Porter Retrieved June 3, 2008. Athanassakis, A. Hesiod: Theogony, Works and Days, Shield. New York, 1983. Beall, E. "The Contents of Hesiod's Pandora Jar: Erga 94-98," Hermes 117. 1989. 227-30. Harrison, Jane Ellen. Prolegomena to the Study of Greek Religion (1903) 1922. 280-85. Griffith, Mark. Aeschylus Prometheus Bound Text and Commentary. Cambridge, 1983. Hesiod, Works and Days Retrieved June 3, 2008. Leinieks, V. "Elpis in Hesiod, Works and Days 96," Philologus 128. 1984. 1-8. Moore, Clifford H. The Religious Thought of the Greeks. 1916. Nilsson, Martin P. History of Greek Religion. 1949. Pucci, Pietro. Hesiod and the Language of Poetry. 1977. Smith, William. Dictionary of Greek and Roman Biography and Mythology. 1870. "Pandora" Retrieved June 3, 2008. Smith, William. Dictionary of Greek and Roman Biography and Mythology. 1870, vol I:177. "Anesidora" Retrieved June 3, 2008. Verdenius, W. A Commentary on Hesiod “Works and Days” vv 1-382. Leiden, 1985. West, M.L. Hesiod, Theogony, ed. with prolegomena and commentary. Oxford, 1966. West, M.L. Hesiod, Works and Days, ed. with prolegomena and commentary. Oxford, 1978. West, M.L. Hesiod, Theogony, and Works and Days. Oxford, 1988. Zeitlin, Froma. 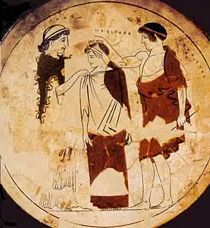 Playing the Other: Gender and Society in Classical Greek Literature. Princeton, 1995. All links retrieved January 12, 2019. This page was last modified on 12 January 2019, at 17:14.